On her eighteenth birthday, Amanda has a dream that feels strangely lifelike. When Amanda recounts the experience to Melinda, the faithful housekeeper who has looked after her since her mother’s death, she assures her it’s meaningless, with no significance at all. But Melinda isn’t telling Amanda the truth. Craig, the older brother of Amanda’s friend Hanna, has loved Amanda from afar for years. But a deep secret, going back centuries in time, keeps him from ever making a move. When Melinda, who has a secret of her own, tells Craig about Amanda’s dream, it changes everything between them. Two vampires posing as men are pursuing Amanda, and Craig is devoted to keeping her safe. Luckily Craig and his sister are Hunters, the only supernatural creatures able to defeat the evil beings. Craig and Hanna will do anything to protect Amanda, because they know that their friend has a special mission…even though she doesn’t have any idea of what’s happening around her or who she truly is. After having a surreal dream on her 18th birthday in which she is wandering through a desolate house, Amanda wakes up confused and wondering why it all felt so real. To celebrate her birthday, her two best friends take her on a surprise trip to the lake to have a private girly party, however they are not alone as two strangers are watching them from afar, noticed only by Hanna. After their party, Hanna seems to be acting strangely and doesn’t want Amanda to be left alone, unless she is at home, and tells her not to invite anyone in to her house. If it’s not Hanna accompanying her to places, it’s her quiet but lovely brother, Craig. Something is wrong and Amanda wants answers, but no one seems to want to tell her the truth. Will she every discover what changed on the day of her 18th birthday? 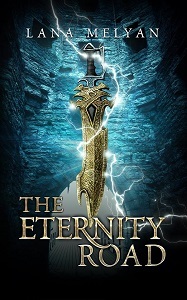 The Eternity Road is a YA Paranormal story written by a début novelist. The premise of the book, a young woman with secrets so hidden that even she doesn’t know about them, thrown amongst a group of immortal hunters, she knows nothing about, is exciting. Add in the Vampires who need her and a few witches along the way and this is the perfect book for paranormal fans. I really enjoyed the book up until it started having flashbacks. Some of them, I’ll admit, were needed as the book wouldn’t have worked without them. Some however, really didn’t add anything to the story, and in fact I actually found that they distracted the focus away from the main plot. I didn’t really need to know all about the hunters’ past lives, and how and why they became hunters. This kind of information is best left either out completely, or written in a prequel. The main characters all had their own voices and characteristics, and all added depth to the story in their own special way. I particularly liked Ruben as this was a ‘man’ who had been around for a long time, and turns out he just wanted someone to love. He thinks that he may have found that perfect person, surprising even himself! Amanda is a strong, sassy young woman, but I struggled to connect with her. I can normally visualise characters in my head when I’m reading, but I couldn’t with Amanda, which was a shame as the story was all about her. The book ends without fully revealing all of the answers, but with a ‘To Be Continued’ as the final sentence, I’m sure that book two will fill you in on them. If you’re in to YA Paranormal books then this is something slightly different to your average novel. A good book which I was eager to read, but it didn’t hold me captivated, unfortunately – I would still need to read book two though, as I have many questions that I would like answering. Lana Melyan studied literature—russian, world, ancient—in college for five years and grew up reading classics, which became a great contribution to her education. She also always loved supernatural stories. Lana Melyan is a huge fan of such incredible writers and creators like Joss Whedon, J.K. Rowling, Neil Gaiman, Suzanne Collins. She lives in Oslo with her two daughters.